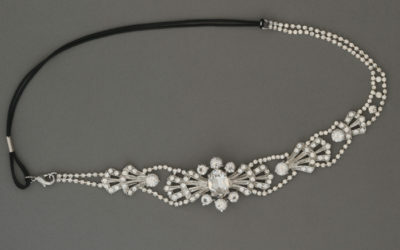 A bolder flexible chain headpiece with asymmetrical design – available on elastic or ribbon. 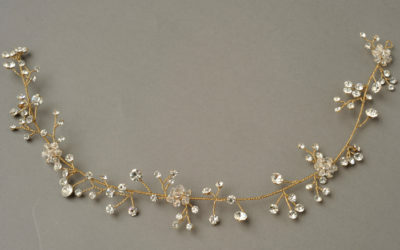 Our original hairvine and one of our longest running pieces. 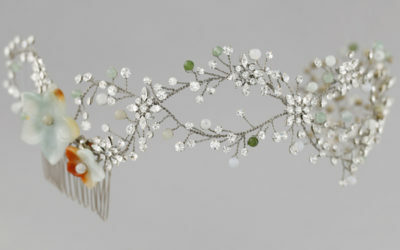 Delicate sprigs of Swarovski crystal, offering the illusion of floating crystals in the hair . 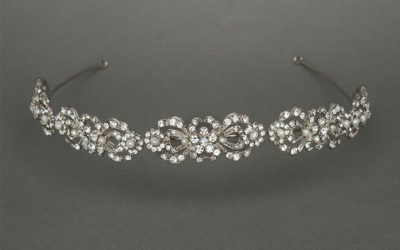 Available in antique Silver, bright Silver or Gold. 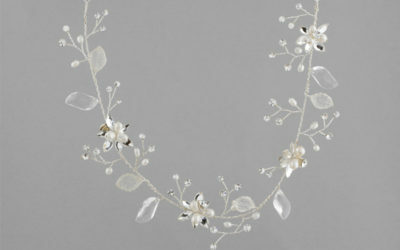 A lovely headpiece with antique bejeweled leaves and Swarovski laden branches – Definitely a headturner. 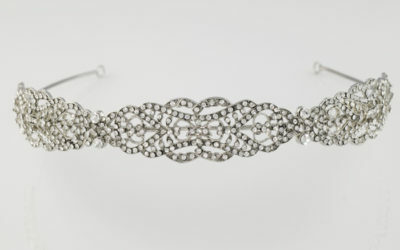 Pure luxury in a headband – lattice design throughout with delicate small size crystals. 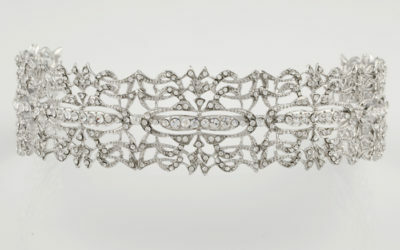 This scalloped ‘statement’ tiara offers flair from Royal ages passed. The combination of baguette crystals and round crystals, offer much dimension and sparkle. 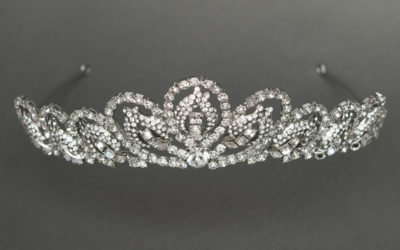 PERFECT for a ball gown. 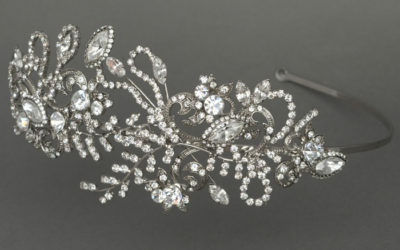 This delicate headband is a perfect match for the bride who prefers minimal sparkle – Dainty oval shaped crystals and pave vines make this a great ‘destination wedding’ headpiece. 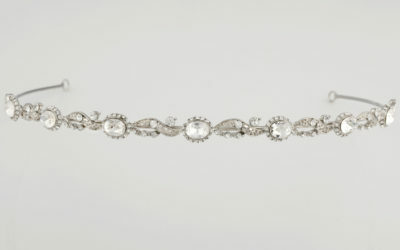 This lovely band offers spectacular sparkle with a classic dusting of fresh water pearls to make it the perfect match for a vintage inspired gown style or for a lace gown. 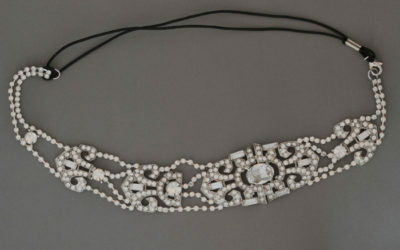 This flexible chain dazzles with its asymmetrical design reminiscent of the Flapper Era. It is available on elastic or ribbon. 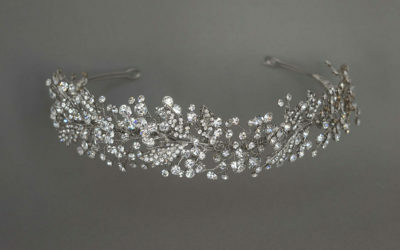 Asymmetrical headband with crystal vines and large navettes. Unbelievably deceiving in the hair..Once the headband bar is hidden by your stylist, the statement design on one side appears to be floating in the hair. Stunner!